Moody's Investors Service announced toward the end of U.S. trading that it was cutting Ireland's debt rating by one notch to Ba1, from Baa3, its lowest investment-grade level. It is the first of the major ratings services to downgrade the country's debt to junk levels. downgrade the country's debt to junk levels. Maximus, the corporation that is suppose to be maintaining the electronic healthcare records for BC CITIZENS, FAMILY COURT social assistance programs are robbing BC estates without detection. What BC ESTATE DEBT VICTIM actually checks ALBERTA COURT registries to find forged debts attached to a criminally transferred BC ESTATE DATING BACK TO 1969 in BC LAND TITLE OFFICES . The lawful security that the ex wife who had assigned her legal rights to the QUEEN (1993) via the FEDERAL GOVERMENT was legally entitled to was $27,000 in 1992. This assignment occured by operation of the law in order for this woman to recieve welfare benifits. the deal was registered in family court for the ESTATE VICTIM TO PAY EX SPOUSE $ 95 a week which was TO BE applied to the matrimonial mortgage debt held by the bank of MONTREAL UNTIL IT was paid in full or wife sold the property. UNDER CONTRACT LAW it was a legal contract. YOU HAVE TO GIVE TO GET. All the mother had to do was to give her TIME to her children and allow them safe shelter in the MATRIMONIAL HOME and report her income to MINISTRY OF SOCIAL SERVICES in BC. 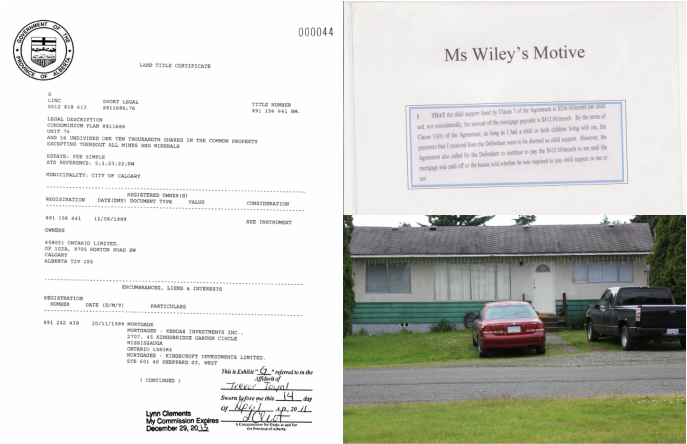 The BC court ordered this deal to continue under the GUISE of child SUPPORT.INTEND OF Justice Meiklem of the BC SUPREME COURT was if wife had no children than she was to pay the mortgage or sell the house. THIS WEBSITE is testomony of the abuse at the hands of GOVERMENT civil servants and officers of the court and more disgustingly the CROWN WHO'S ETHICS AND MANDATES are to protect the vulnerable citizens. This has been a 20 year witchhunt against this father and family . WHEN THIS ugly head of CROWN fraud within many ministries started surfacing the LEGAL DURRESS, STALKINGING ,AND ATTACKS began happening on a daily basis. I demand a cease and desit order against all those who continue to harrass my family. This harrasment is now GOING GLOBAL AGAINST A victims extended family thanks to MAXIMUS estate JUDICIAL SOVERIEGNS. don't care about oaths and perjury because they don't take the BIBLE SERIOUSLY yet this is the basis of the the LEGAL SYStEM. protect their own at a GLOBAL LEVEL and to lie for the their COMMANDER IN CHARGE or FOR THE CAUSE . ego and financial gain comes before due process, constitutional or legal contract/democratic rights of the VICTIMS. have zero interest in what is in the BEST INTEREST of Families and children, or for that matter any unfortunate citzen who's private information gets into Maximus control. If this federal GOVERMENT AND MAXIMUS did care whats best for children and families you wouldn't be reading this nightmare aided and abetted by the MINISTERS OF THE Crown IN BOTH BC ,ALBERTA AND EVEN ONTARIO. I HOLD this GOVERMENT OF CANADA to be criminally liable and 100% responsible for the death of my own father and aunt (brother and sister) caught in the crossfire due to this GOVERMENTS desperate attempt to cover up their own corruption while continuing to rake in illegal investment monies through a crown financial institution ATB in collusion with RBC. THE federal goverment took on the creditors legal rights which were based on mortgage and deed fraud and other fictious lawsuits therfore should be held criminally liable for it's enforcement. It is unfathomable to think that the federal goverment would and did created fictious idenities in order to recoup illegal profits. WHAT ever ministry, BANK, crown minister,individual, judge,lawyer, sheriff,land titles registrar,court administrator ,chartered bank,crown institution who authorized the advancement of these mortgages,liens need to be investigate and prosecuted. FEDERAL GOVERMENT/MAXIMUS HIGH INTEREST PONZIE investment scam. This fraud has to be exposed before it can be stopped before more people die OR BECOME injured because of the WRONGDOERS desperate cover up. A 1988 version of an original mortgage document with a date of 1995(SEPT 25) in fine print on the bottom of the mortgage document obviously appears to be a forged 1988 orIginal. Not to mention the sloppy cut and paste forgery work looks like a 5 year old signed theses bogus mortgage documents.